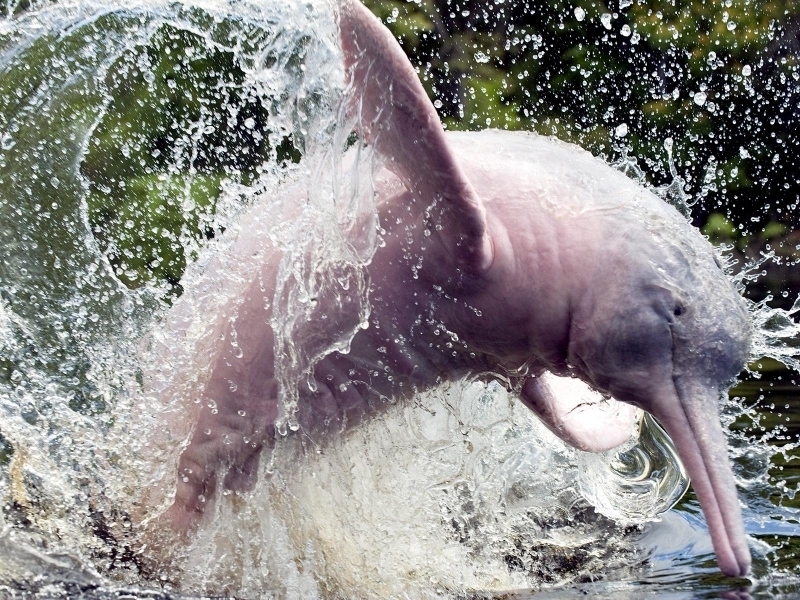 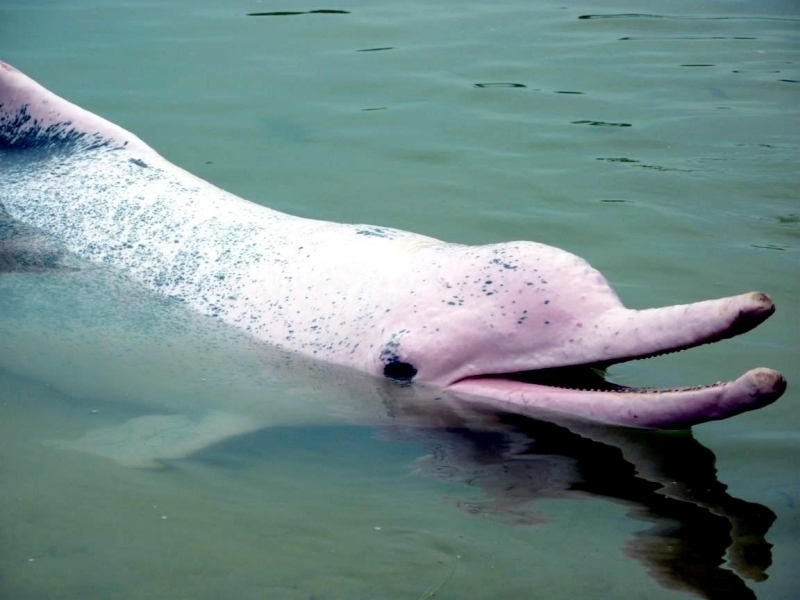 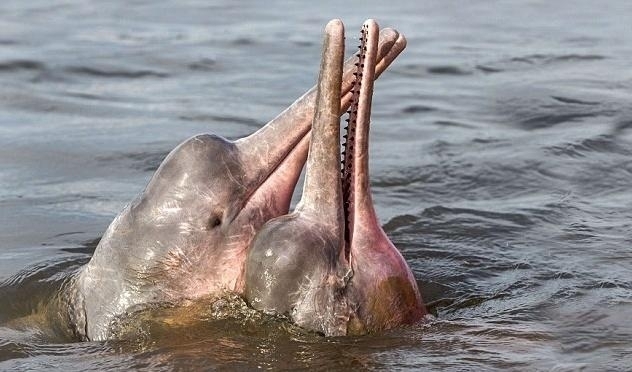 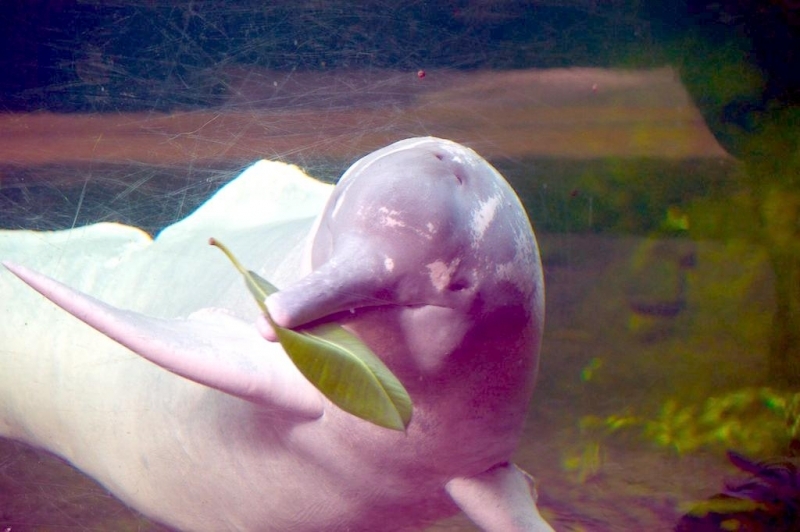 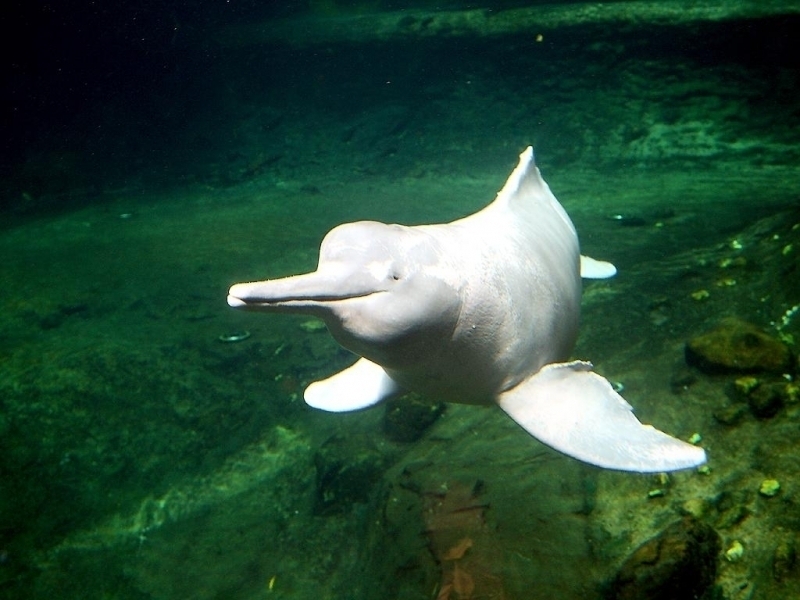 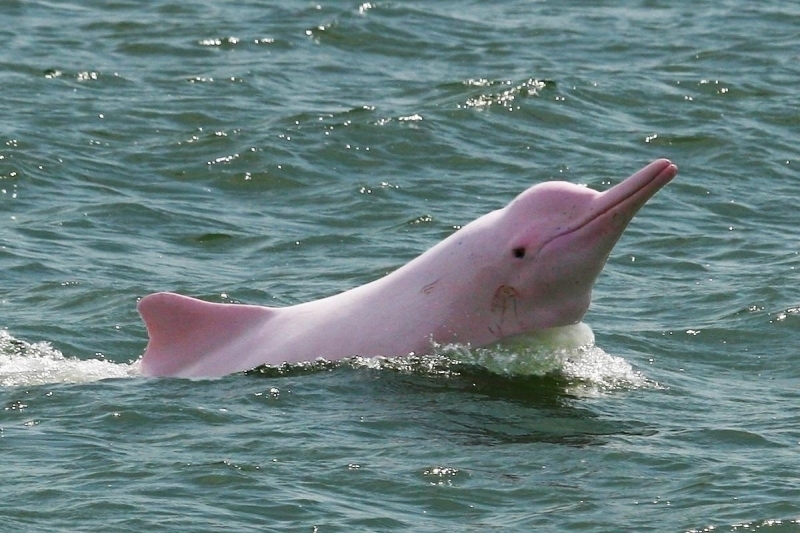 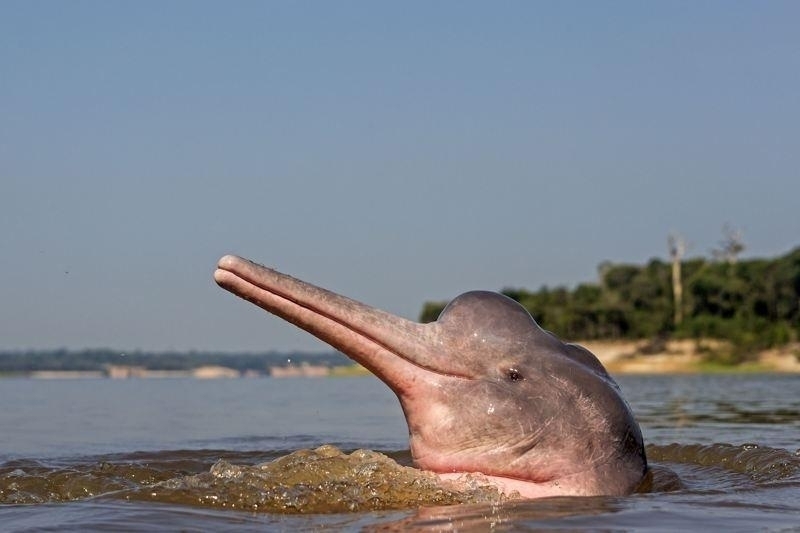 Amazon River Dolphins are also known as the Boutu and the Amazon Pink River Dolphin although they range in color depending on their age, are one of the few species of freshwater dolphins and the most well-known of the river dolphins. 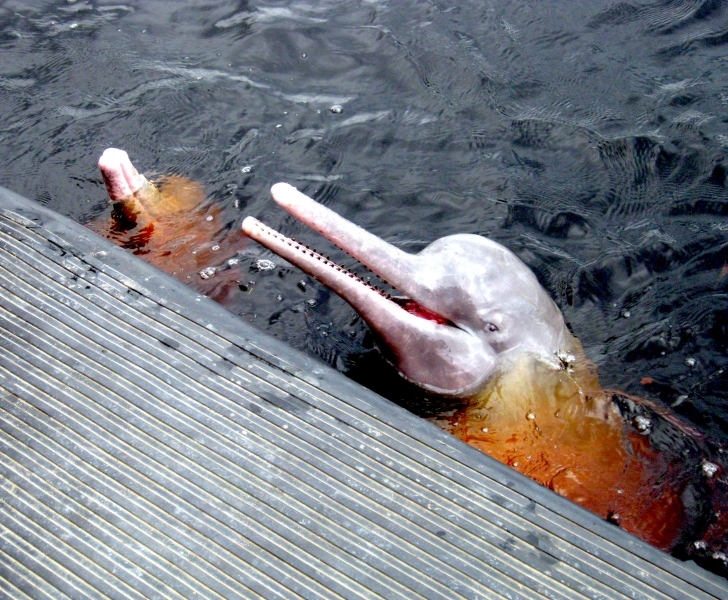 They are a medium size dolphin with long beaks, a stocky body and prominent forehead. 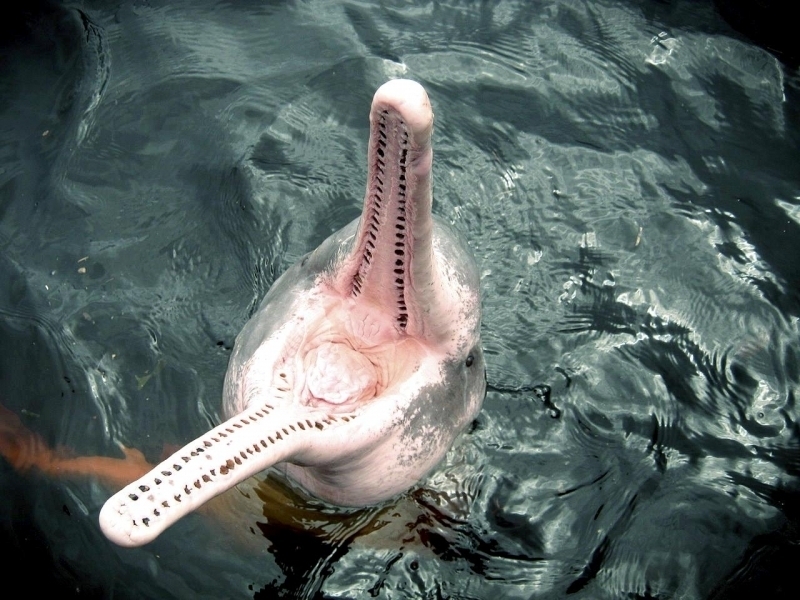 Males measure about 2.5 meters in length; females average 1.8 meters with a maximum length of 2.4 meters. 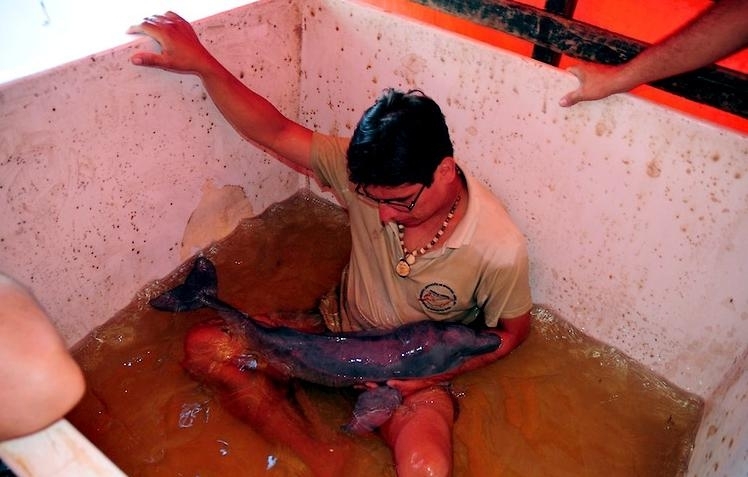 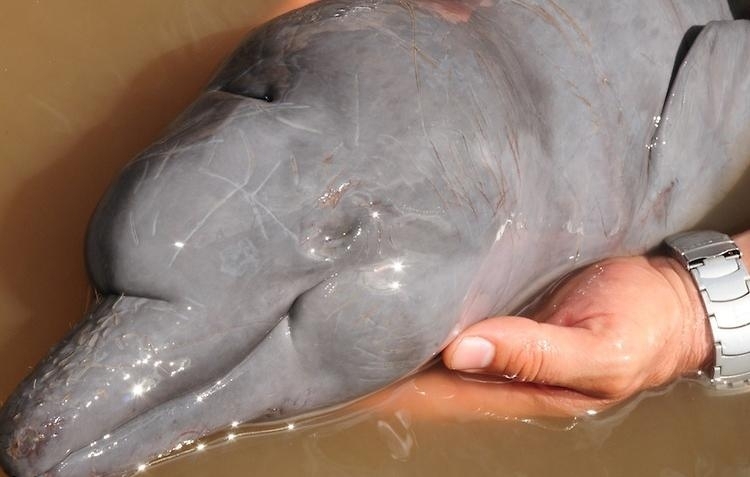 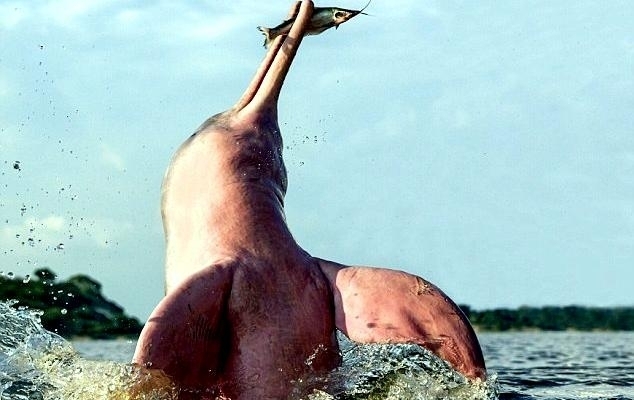 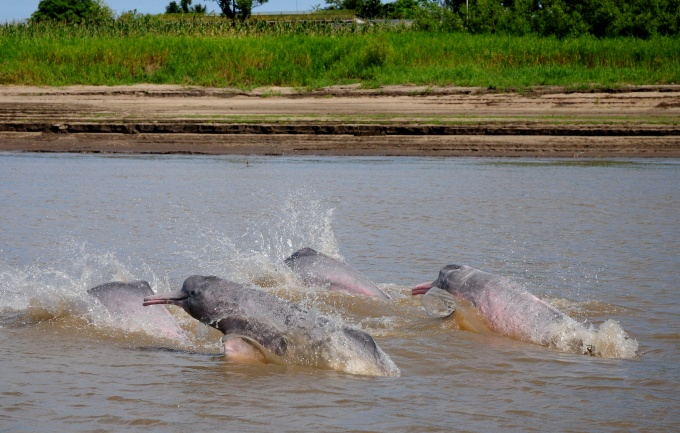 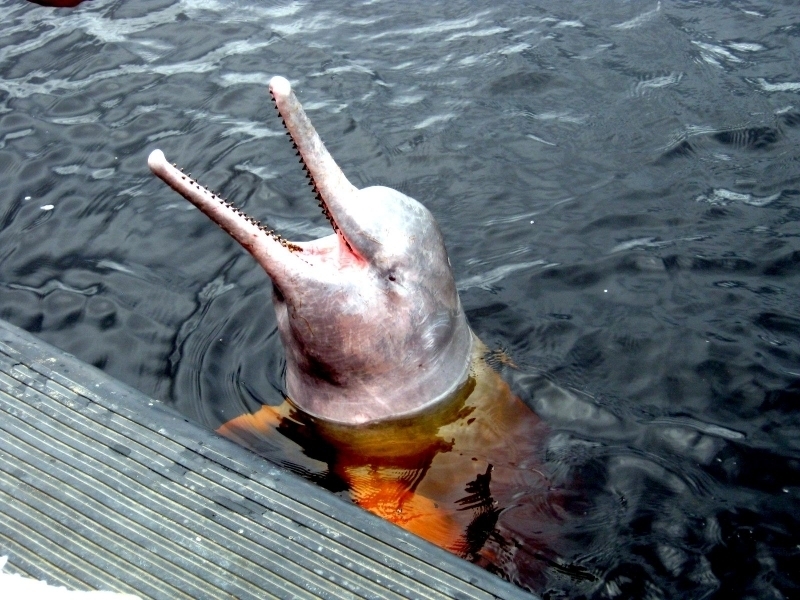 Amazon River Dolphins weight up to 160 kilograms. They have long beaks with 24-34 conical and molar-like teeth. 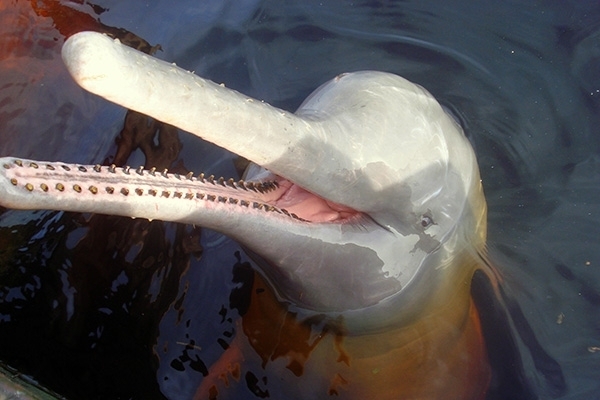 The conical teeth in the front of the mouth are used for holding prey, the molars in the rear of the mouth are used to grind food before swallowing. 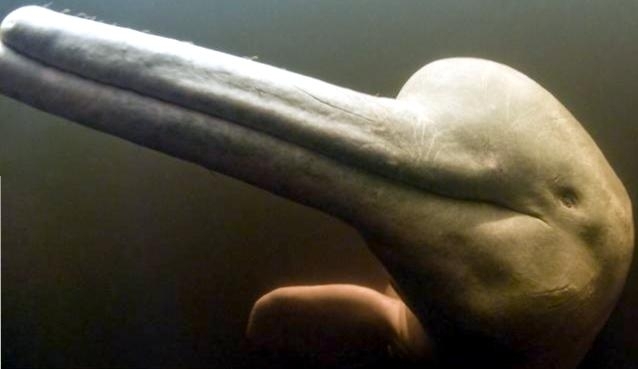 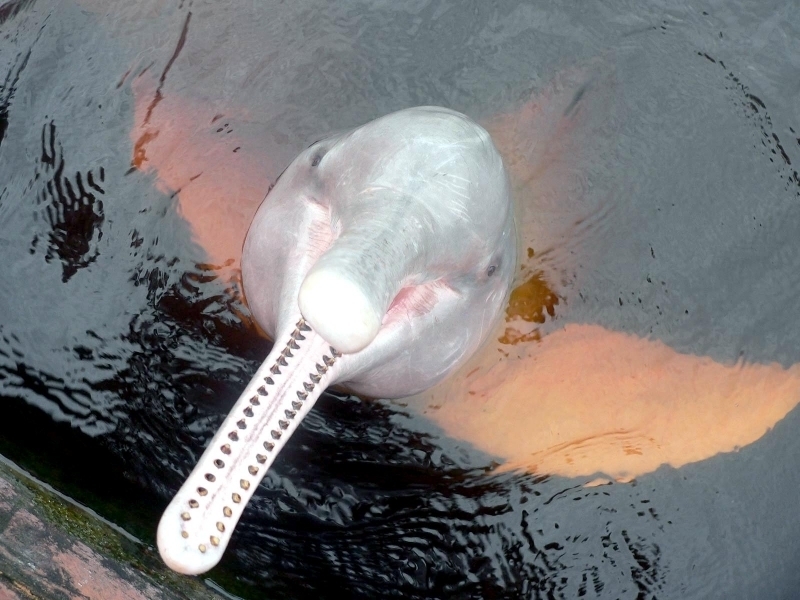 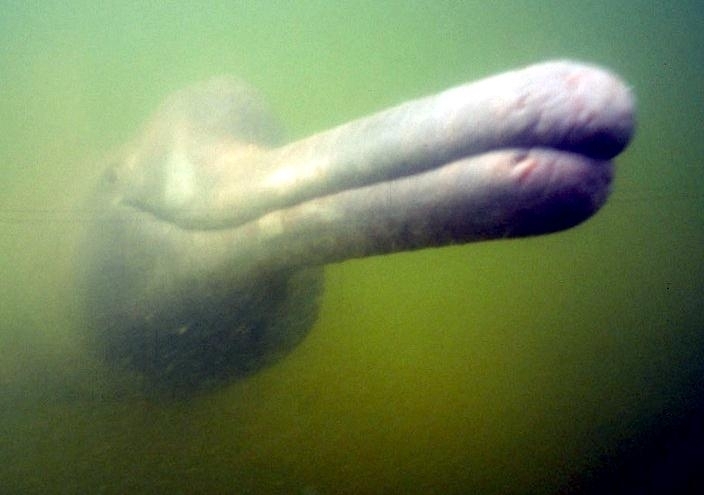 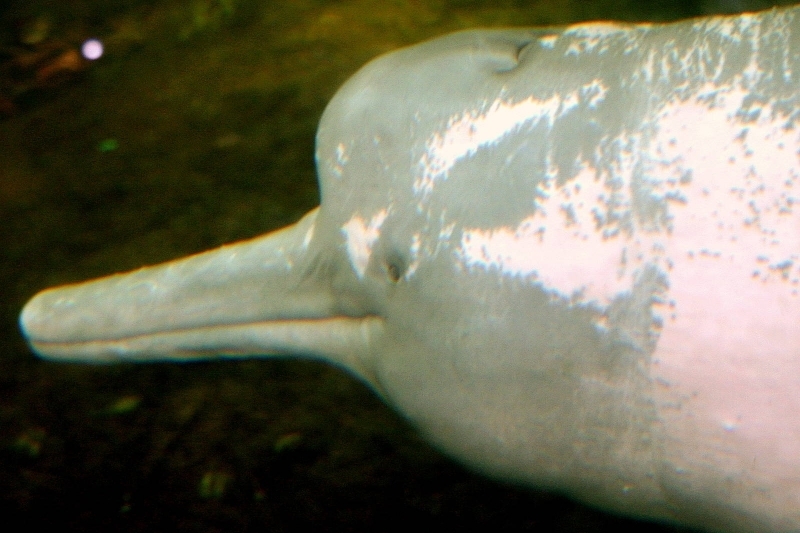 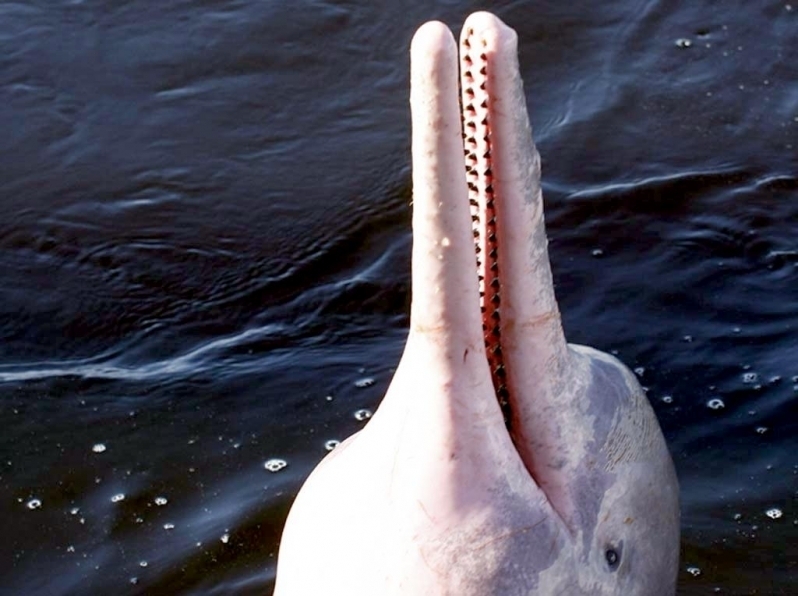 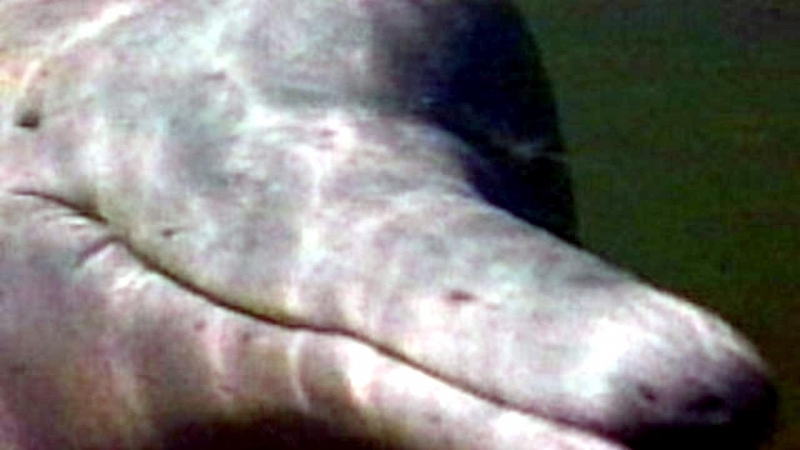 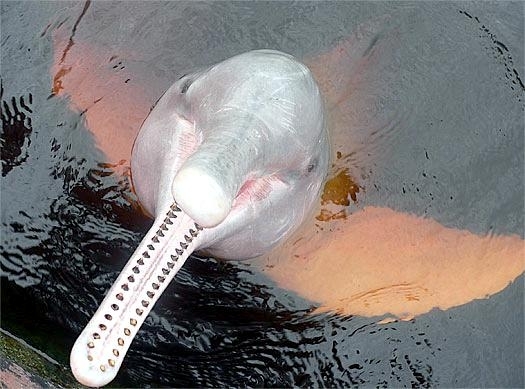 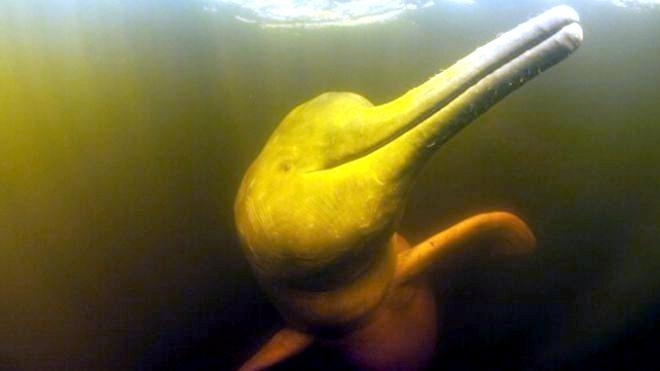 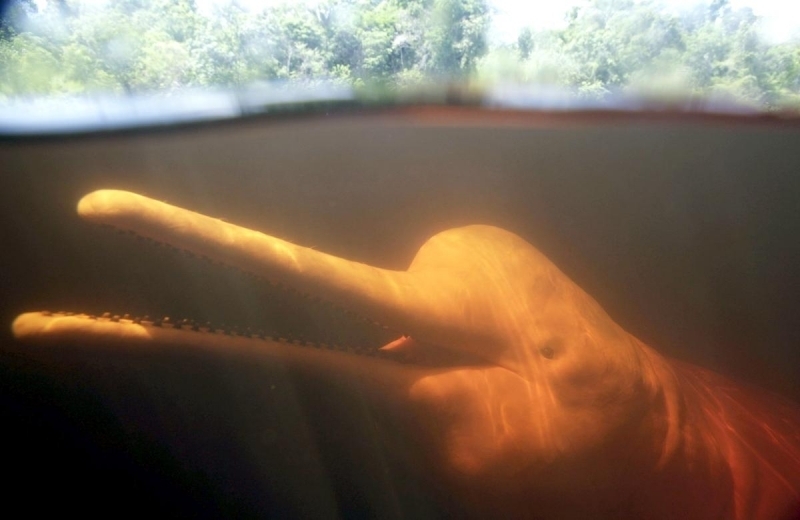 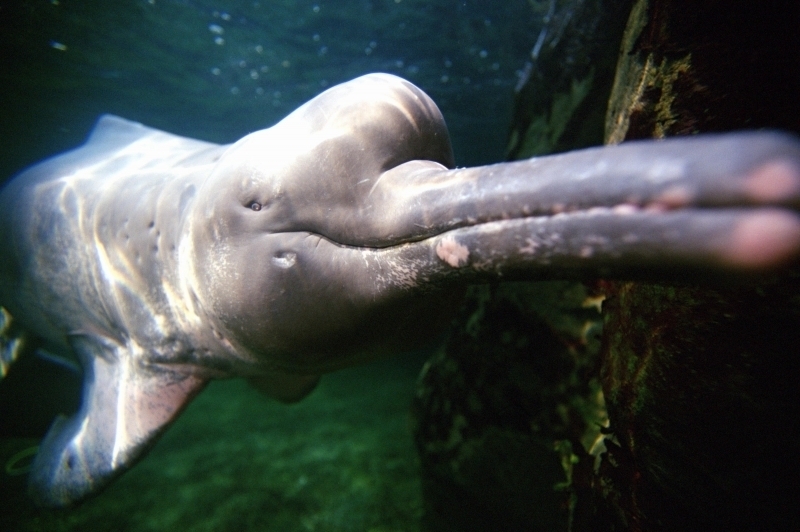 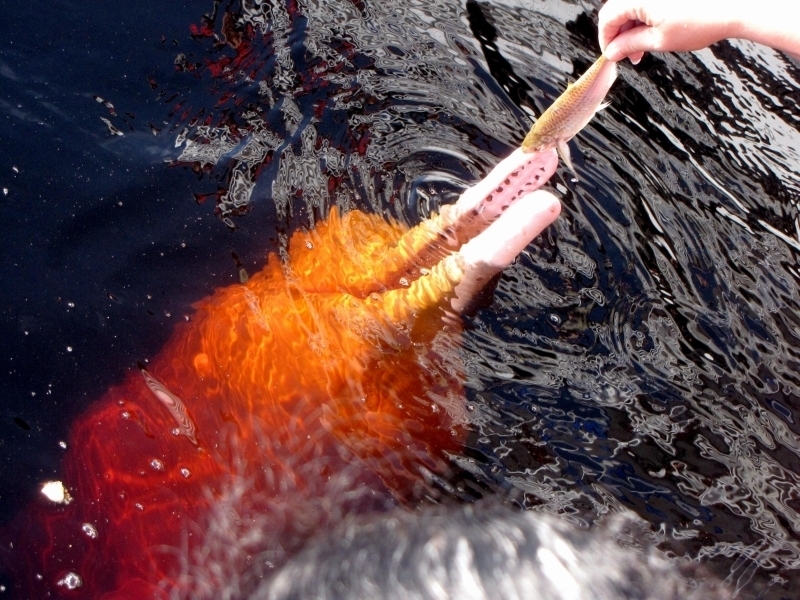 A characteristic unique to the Amazon River Dolphin is stiff hairs on the beak; the hairs are a sensory organ that help sense prey in muddy river bottoms. 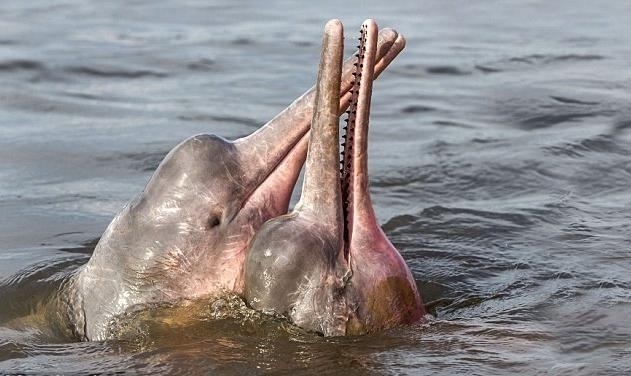 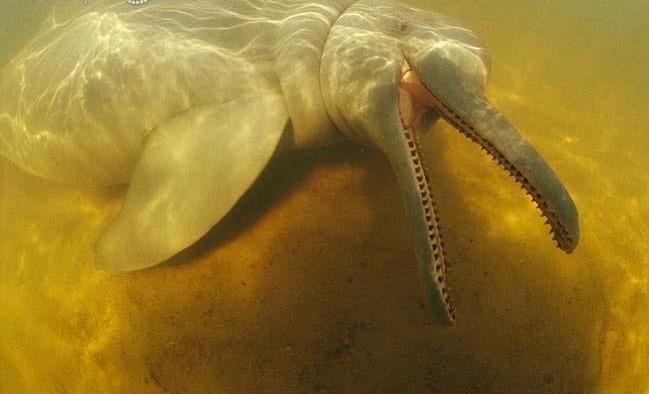 Another interesting characteristic is that Amazon River Dolphins are able to move their neck unlike other dolphin species that have fused vertebrae. 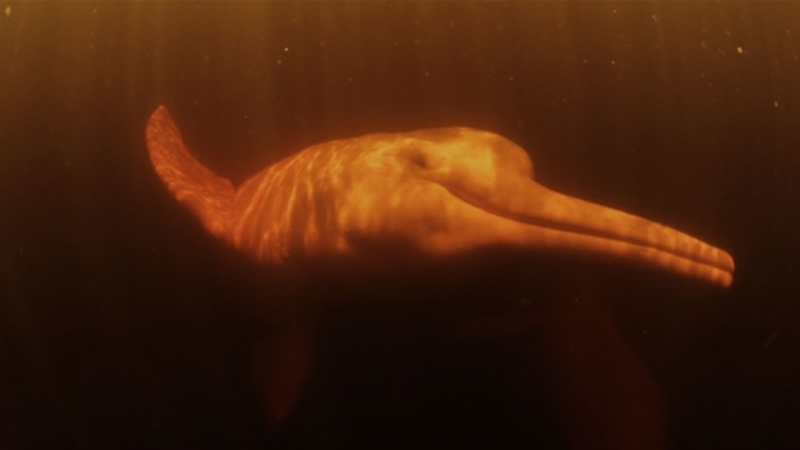 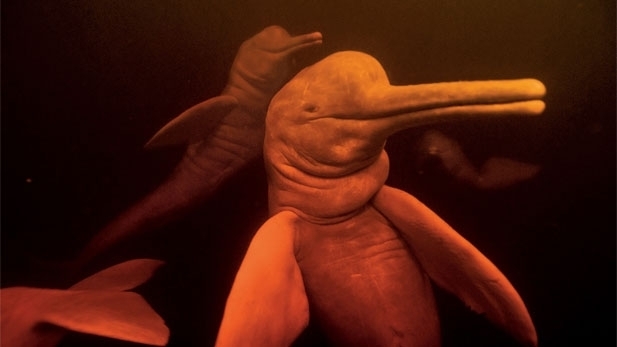 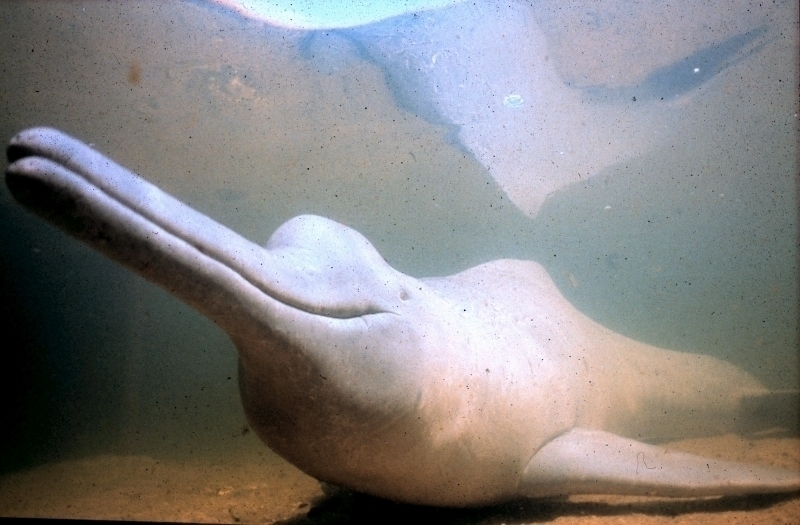 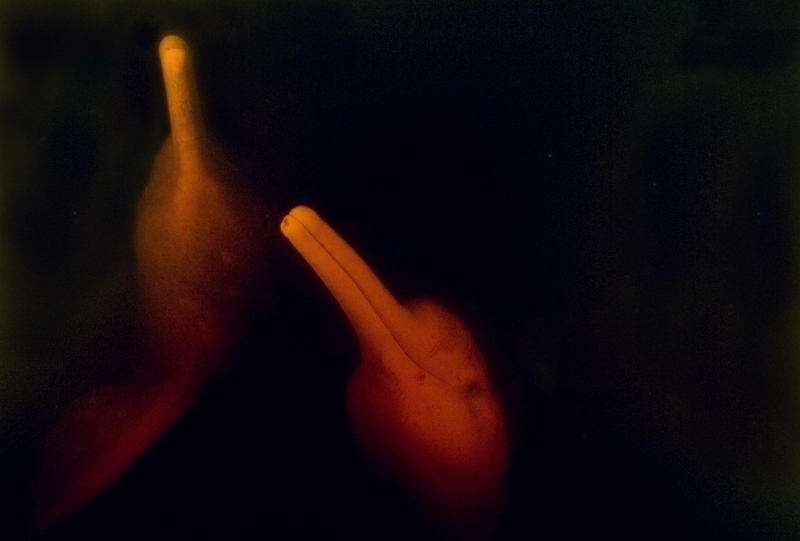 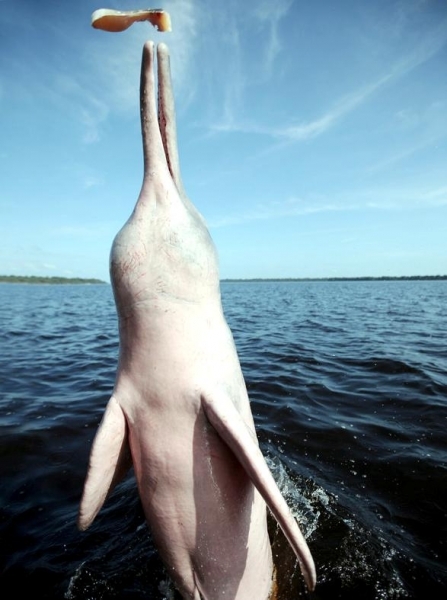 Neck mobility enables the Amazon River Dolphin to look to the side or down. 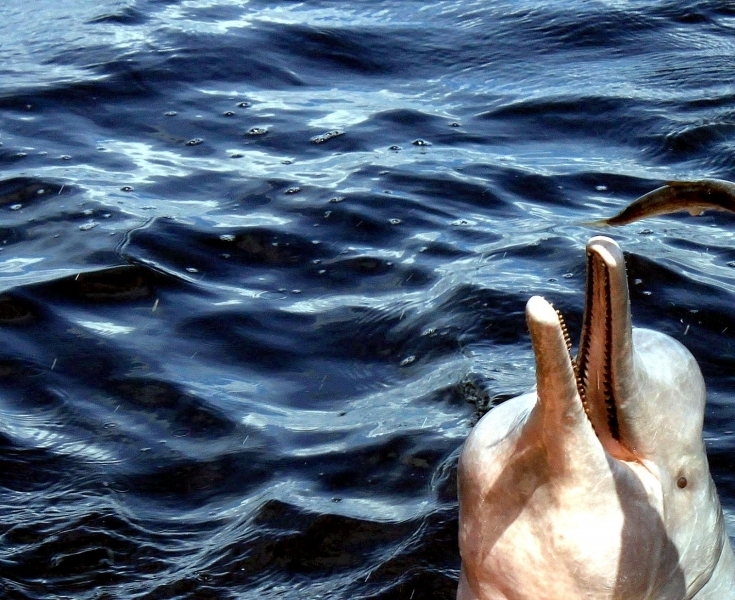 They are also known for their keen eyesight & hearing. 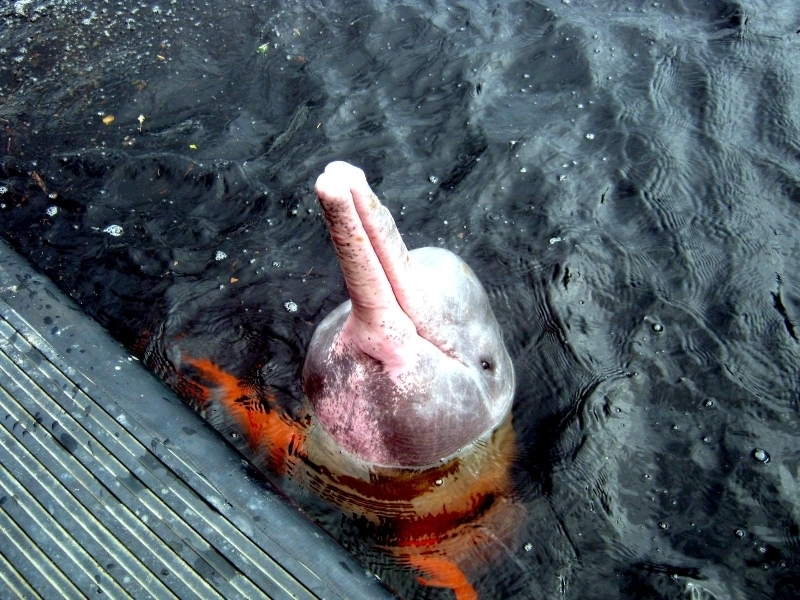 The reasons for the unique coloration are poorly understood, but the presence of capillaries near the surface of the skin probably accounts for much of its characteristic pink flush. 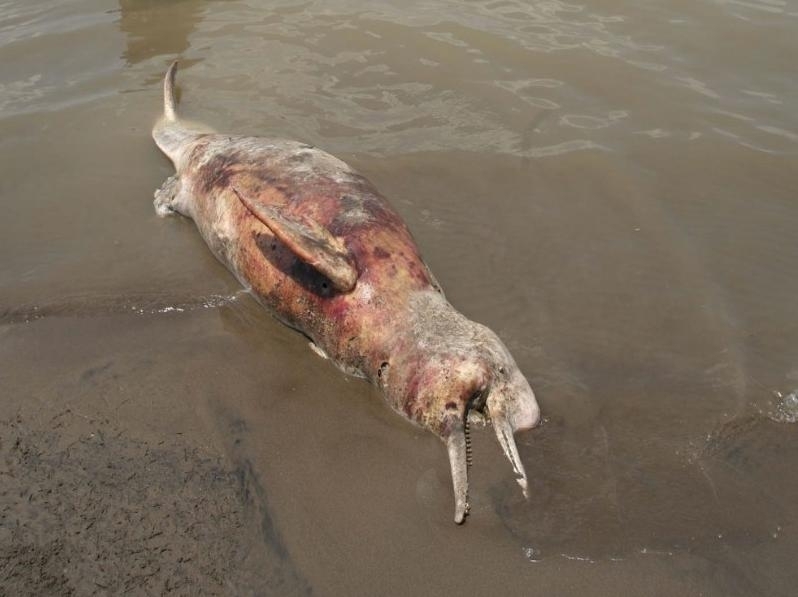 Other factors may include age of the animal, chemical disposition of the water (especially iron content) and the temperature of the water. 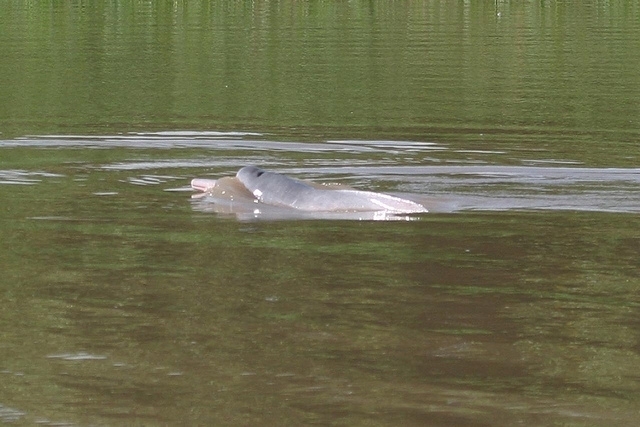 Juveniles are dark gray on the dorsal side, lighter gray on the ventral side. 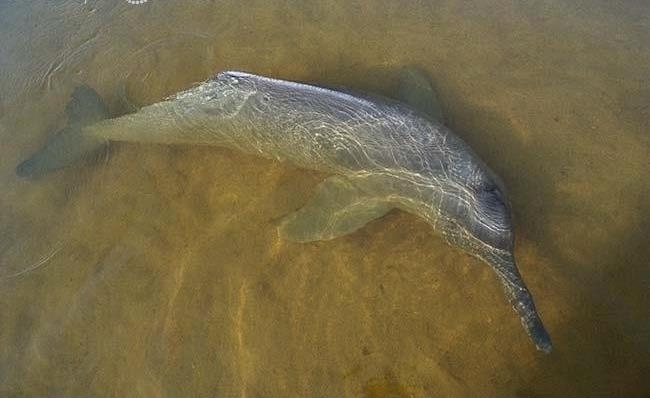 As they mature, the ventral side & flanks turn pink making these creatures almost mystical. 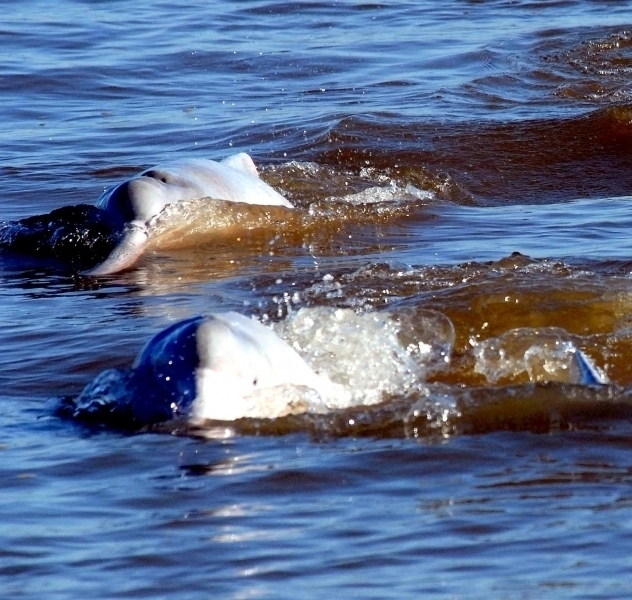 They become lighter with age, tinged with white and blue-gray coloring. 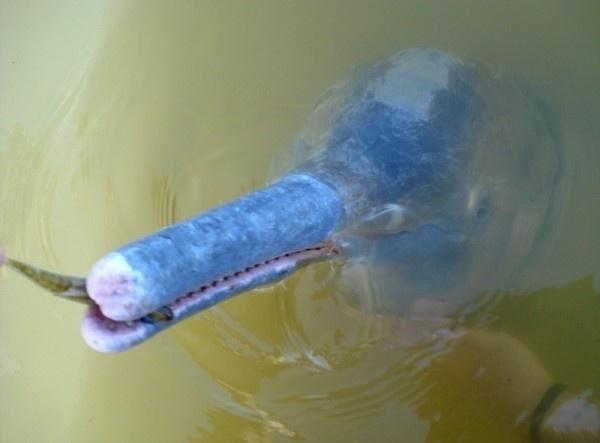 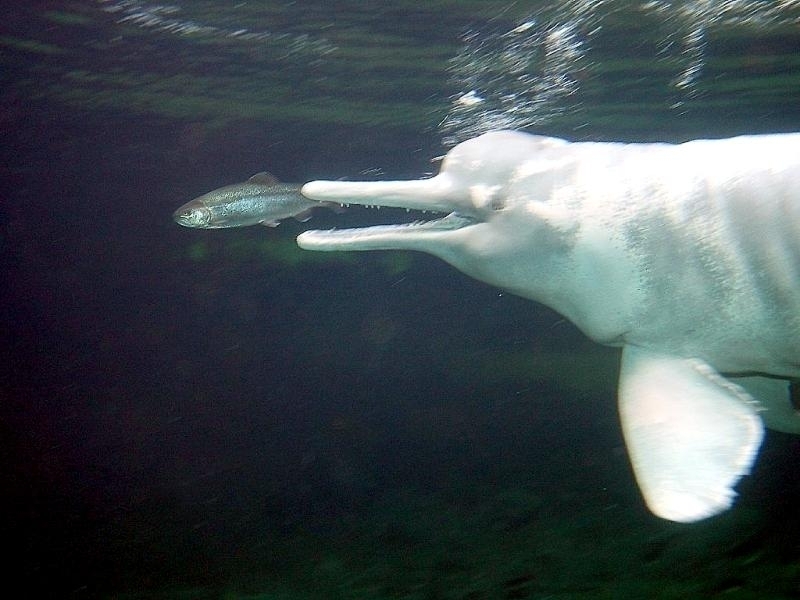 Amazon River Dolphins feed on a large variety of fishes, generally near the bottom including Amazon Catfish as well as other river fish including Piranhas and crustaceans. 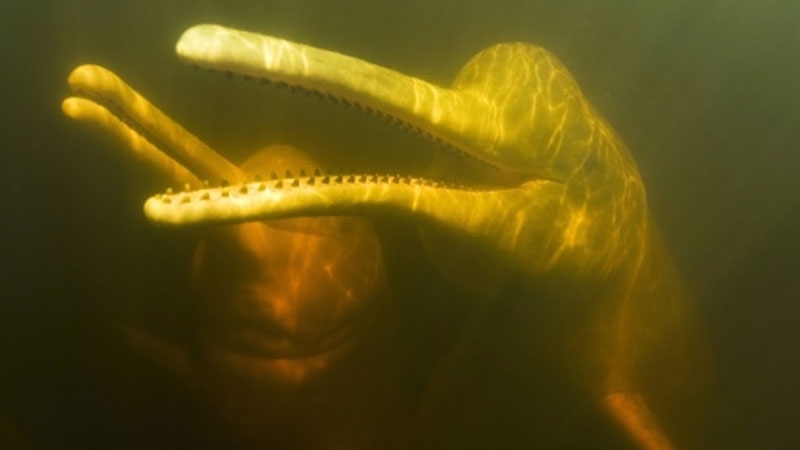 Some of their prey have hard outer shells and dolphins have been observed breaking up their larger prey before swallowing. 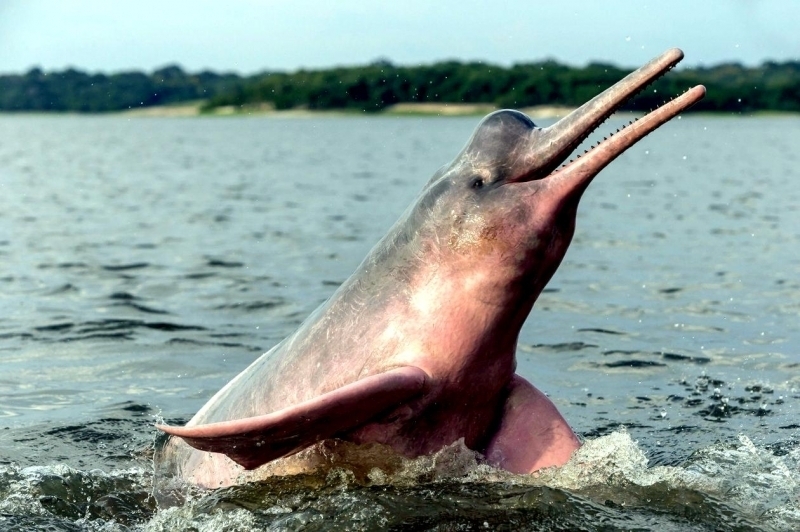 Males reach sexual maturity at about 2 meters, females at about 1.7 meters. 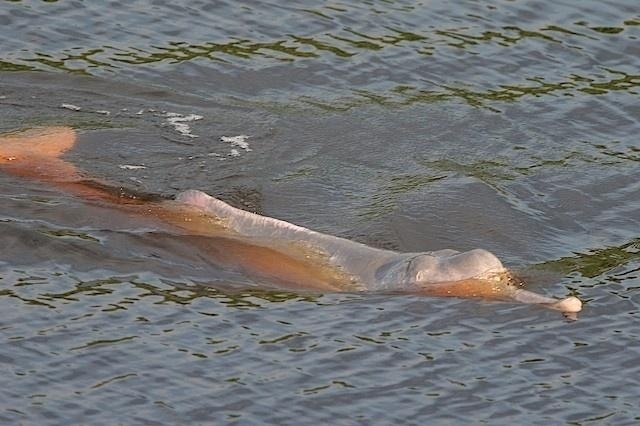 Calves are born between July & September following a 9-12 month gestation period. 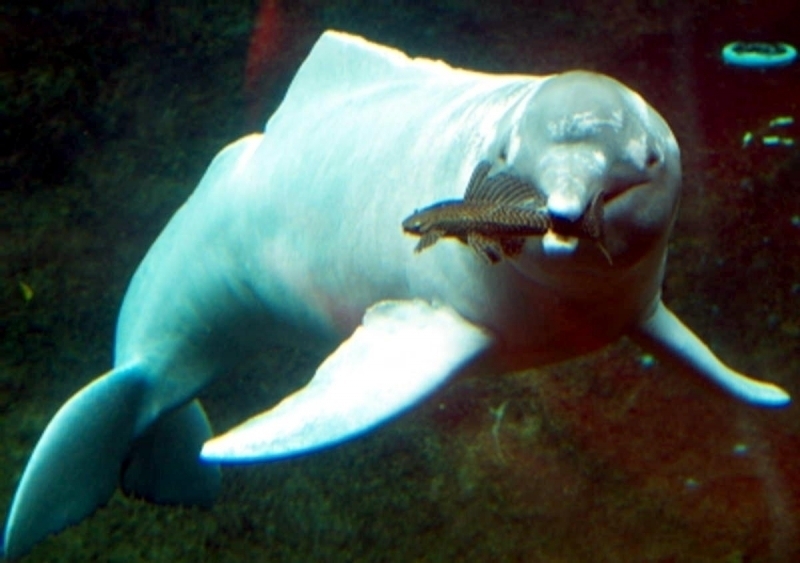 Newborns measure 80 centimeters in length and weigh about 6.8 kilograms. 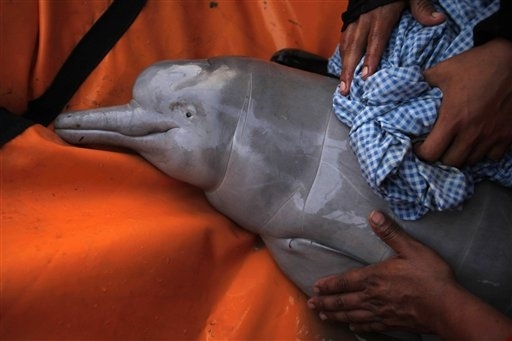 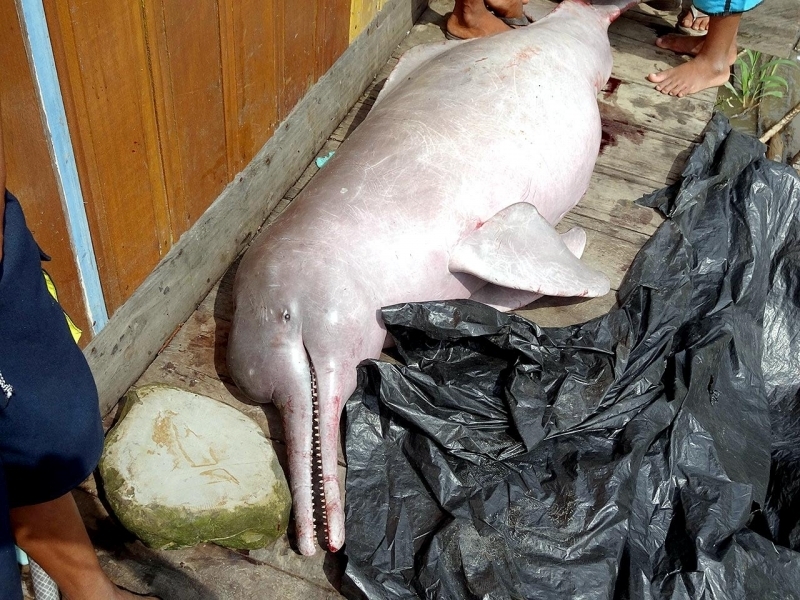 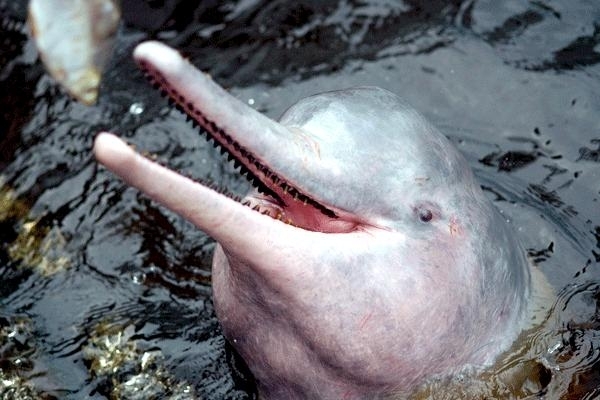 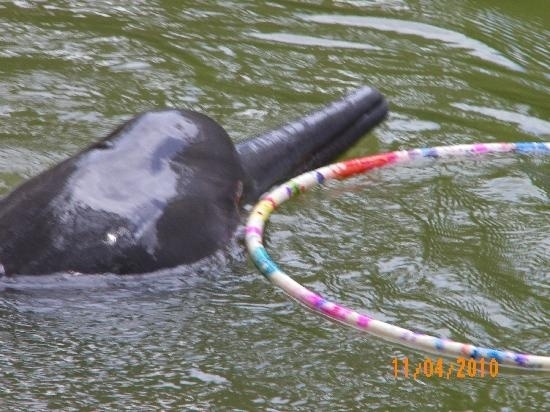 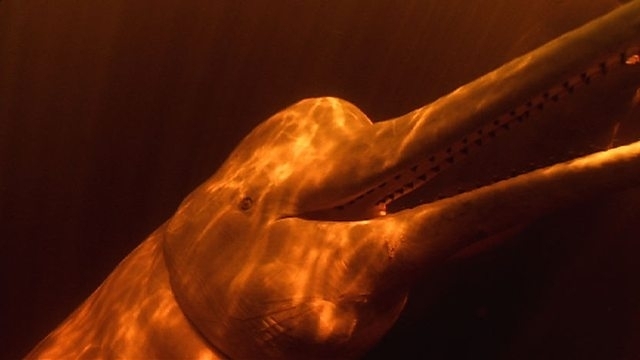 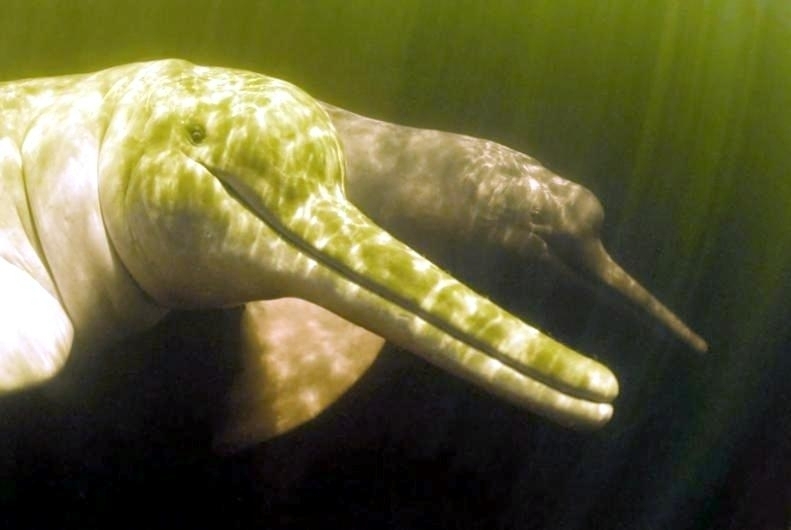 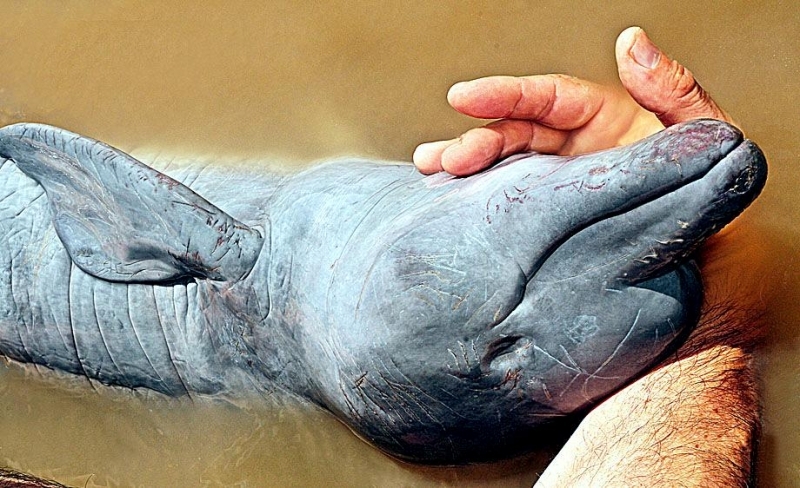 South American Indian folklore hails the Amazon River Dolphin as sacred leading to the belief that hunting & killing them would bring bad luck, therefore the dolphins were somewhat protected. 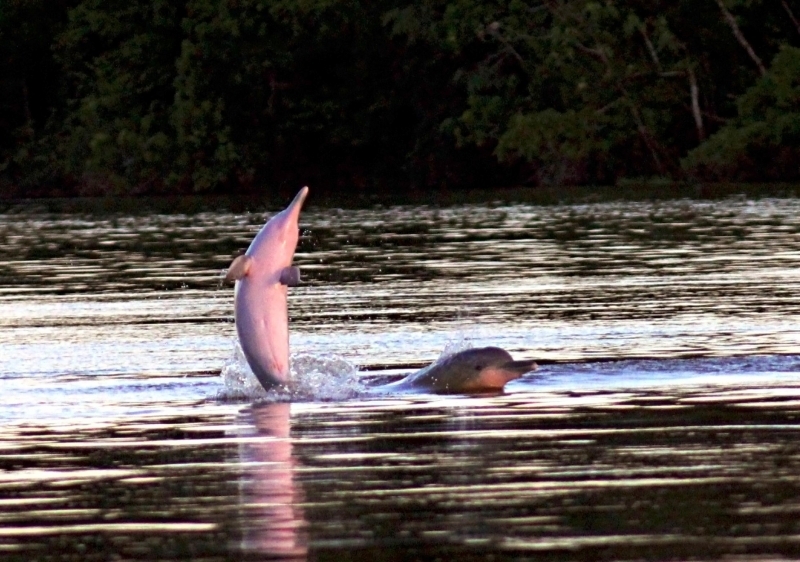 The arrival of new settlers ended that protection as numerous Amazon River Dolphins were killed for their skin for leather & fat for cooking. 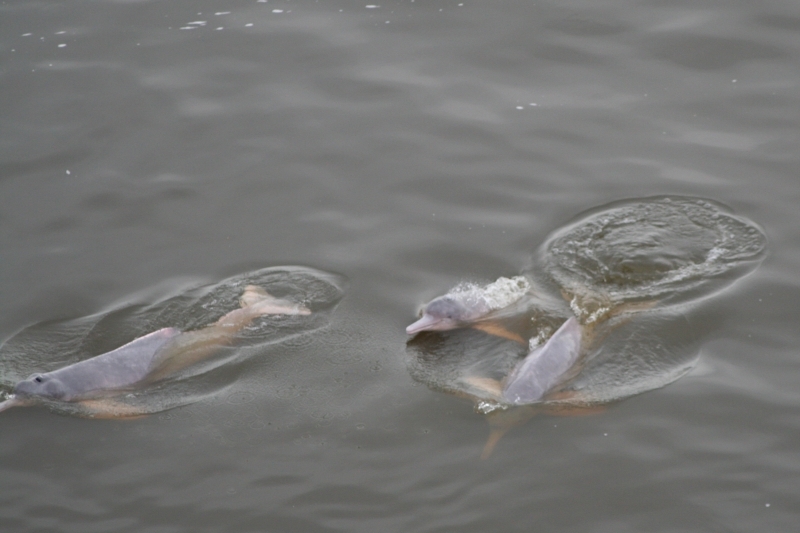 They are threatened by various activities, among them are incidental catches in fisheries, damming of rivers associated with hydroelectric development, deforestation & pollution from mercury mining operations. 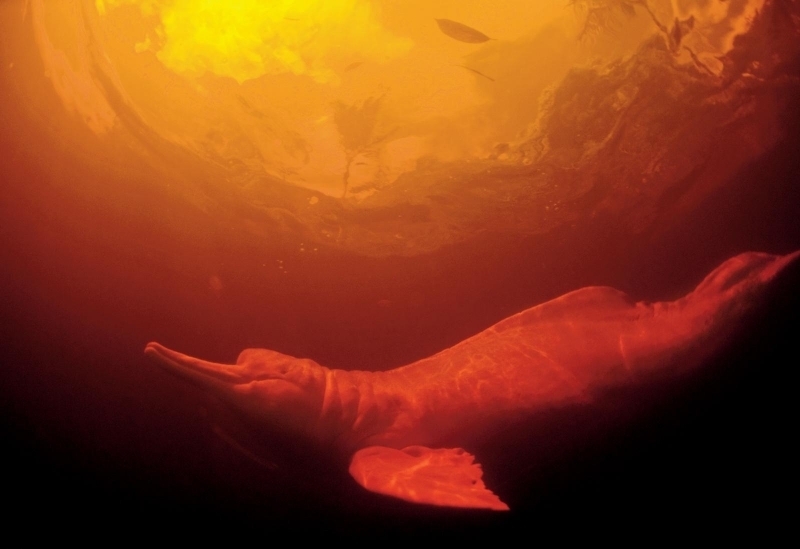 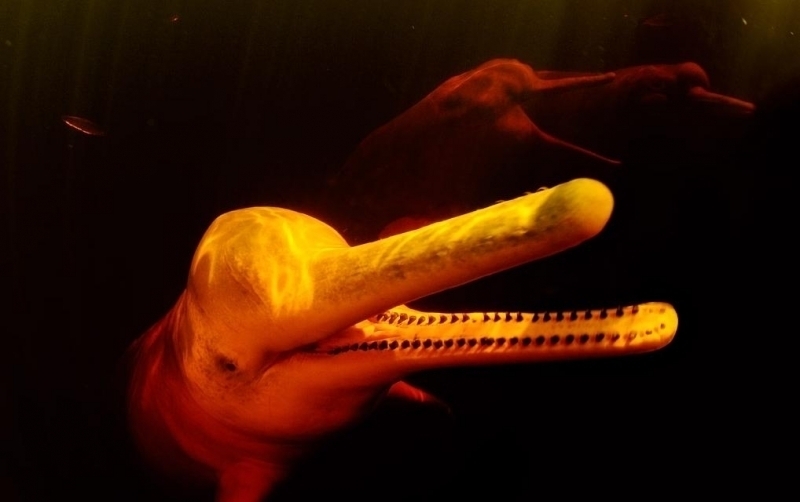 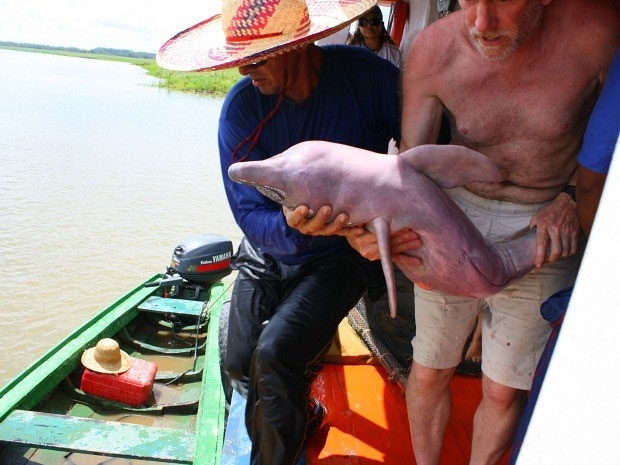 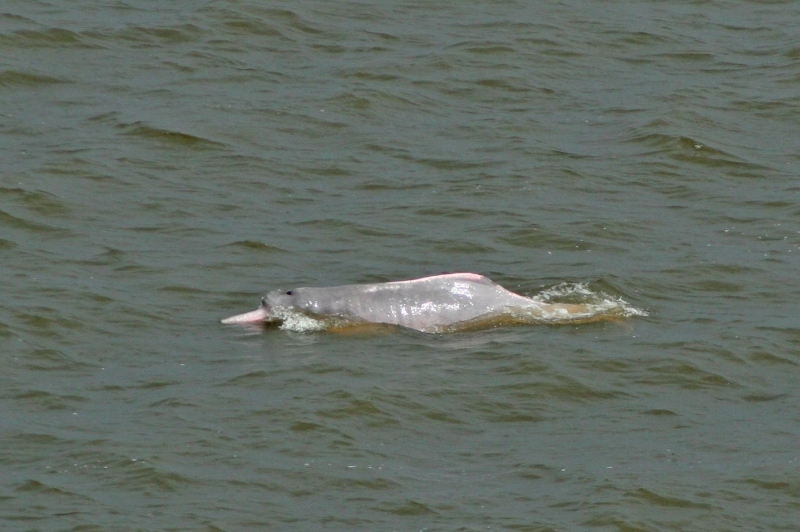 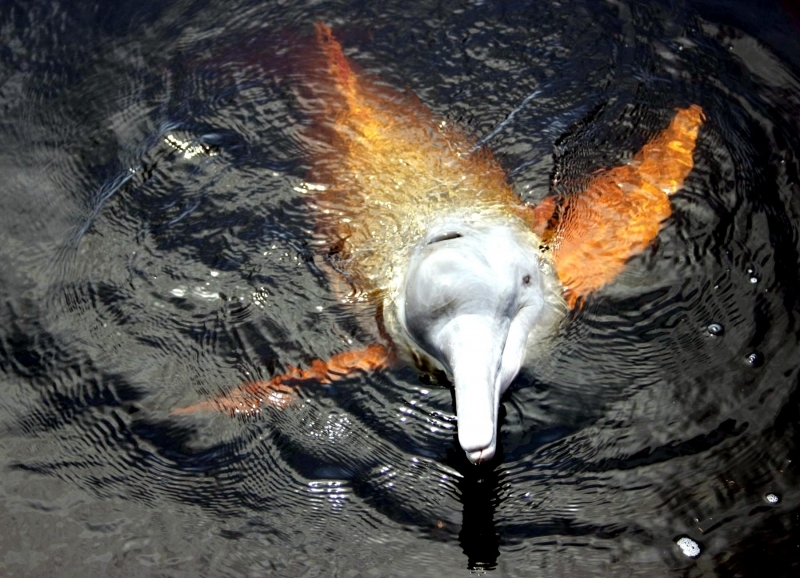 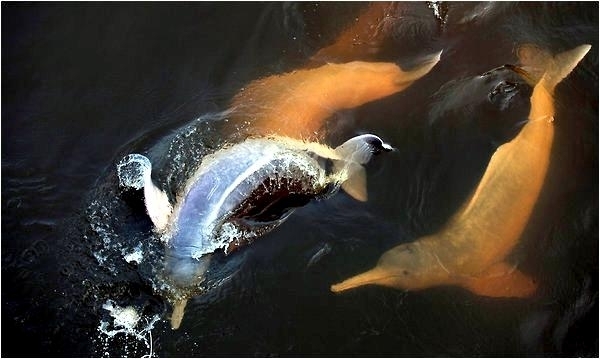 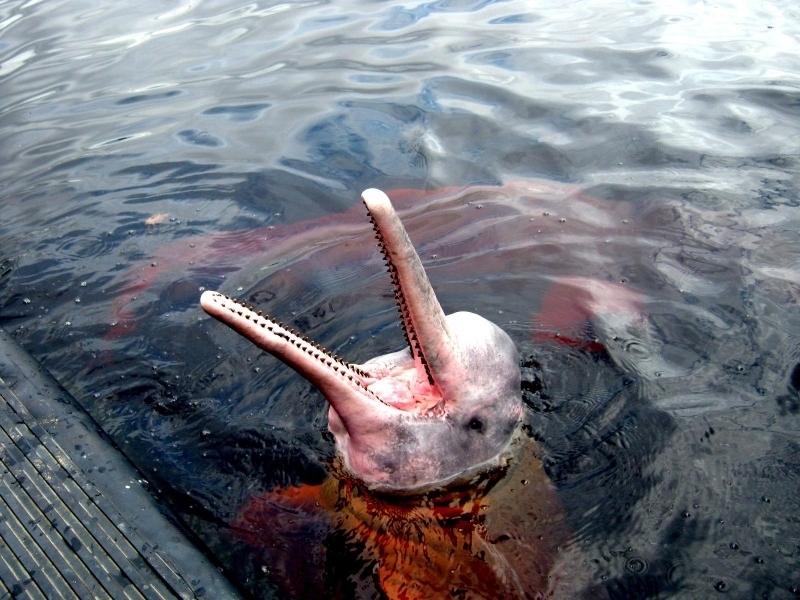 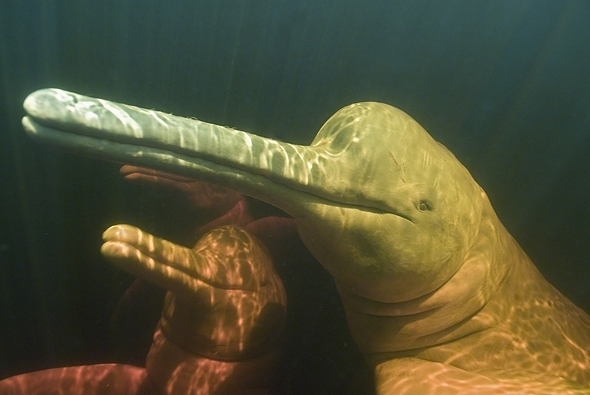 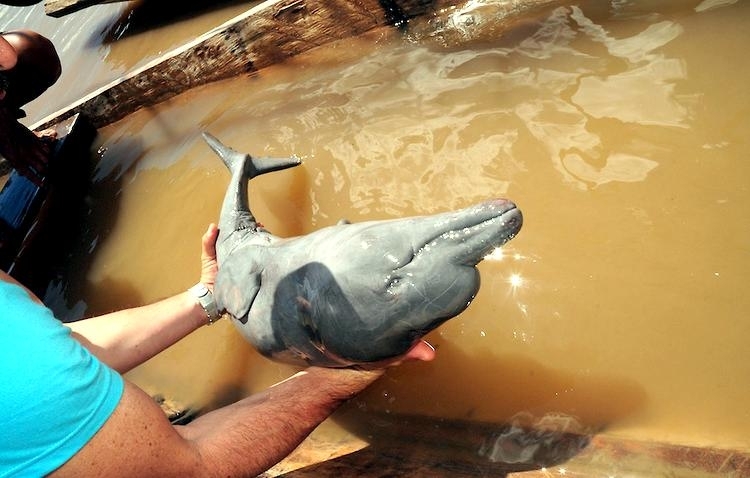 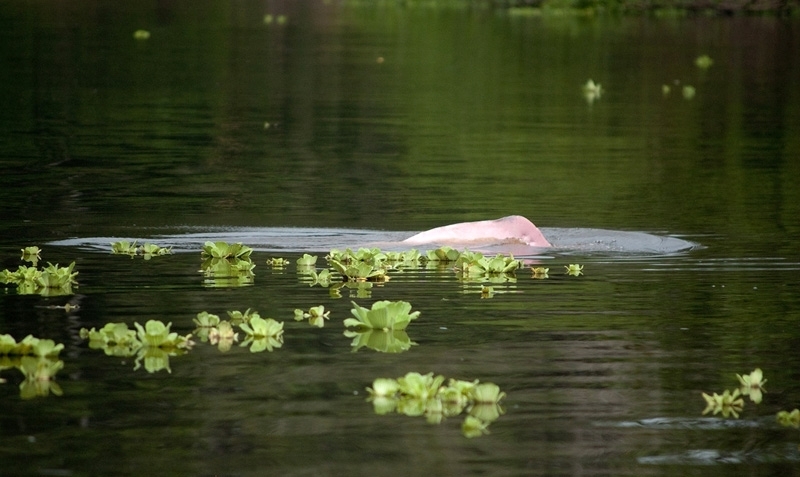 Despite these problems, the Amazon River Dolphin is still abundant in many parts of their range. 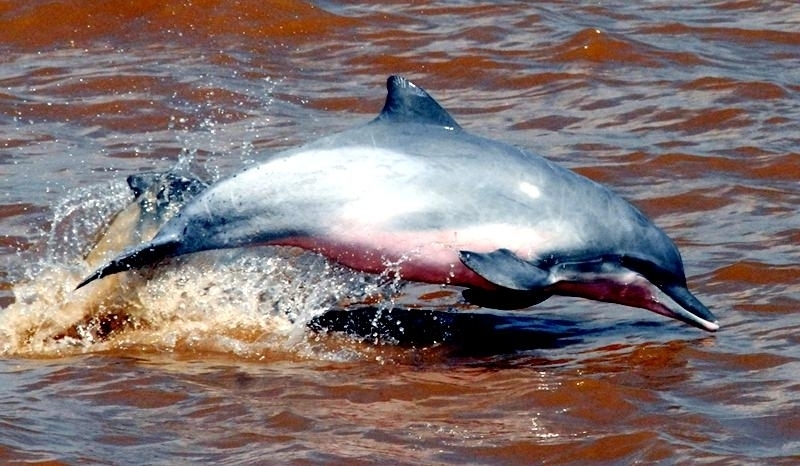 Unlike other dolphin species, they have no dorsal fin but they do have a dorsal ridge. 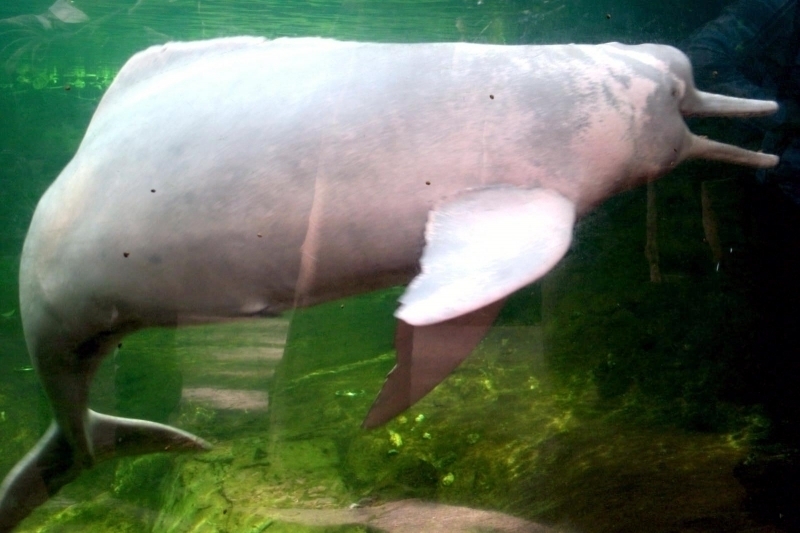 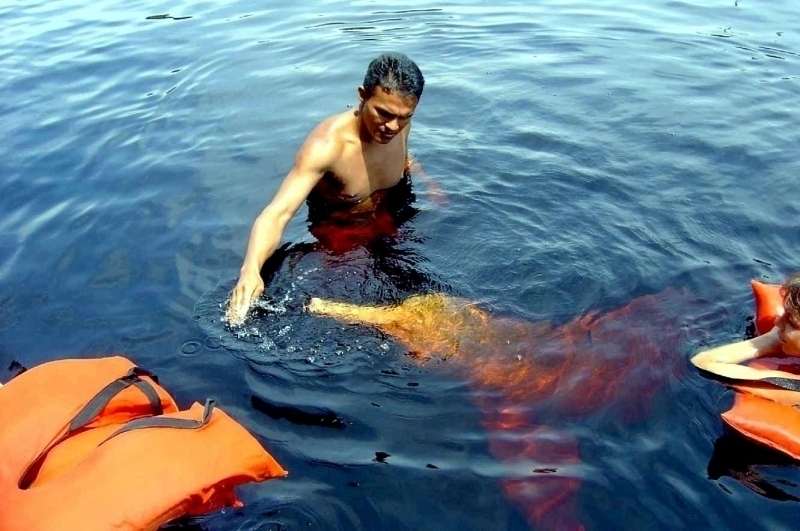 The flippers & flukes are large, likely used for maneuvering in shallow river waters. 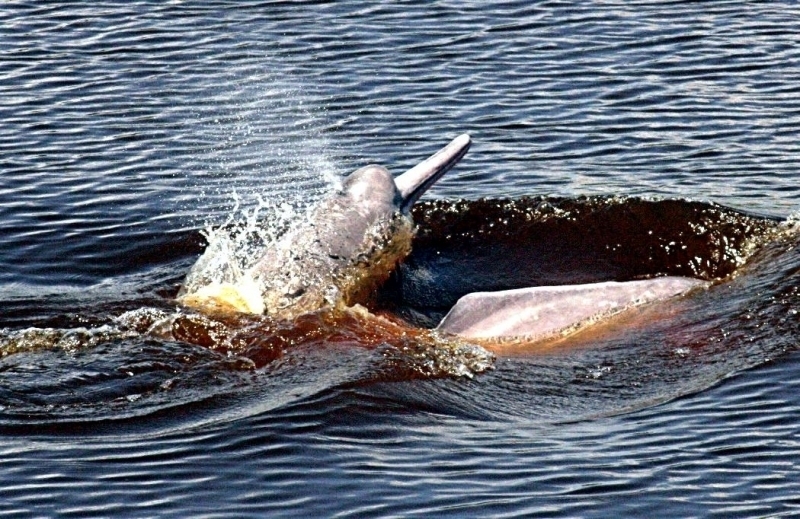 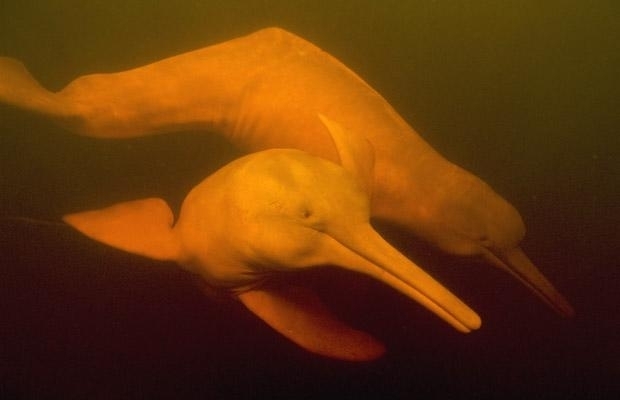 Amazon River Dolphins are often found singly or in pairs. 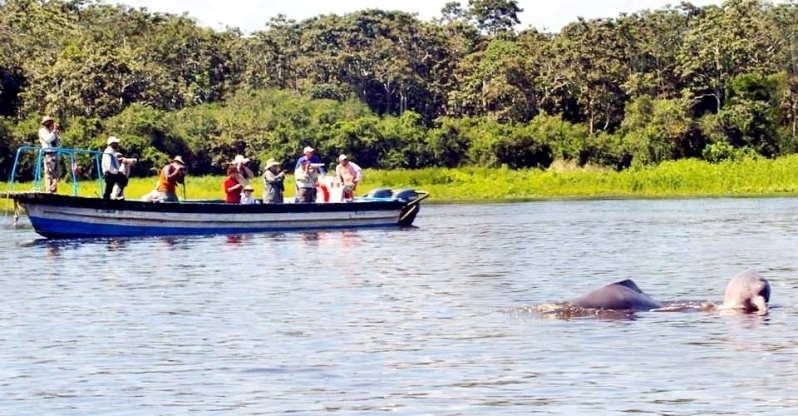 They are a gregarious species unafraid of boats. 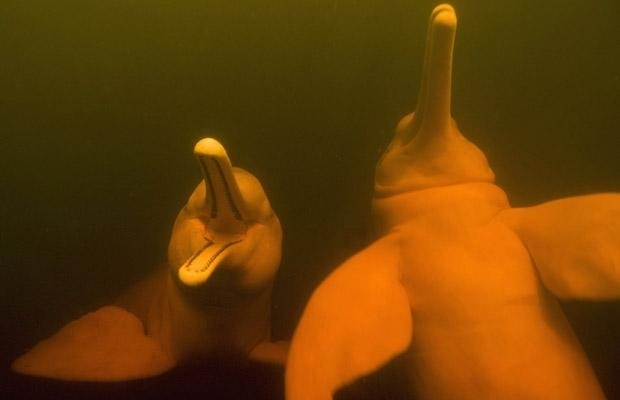 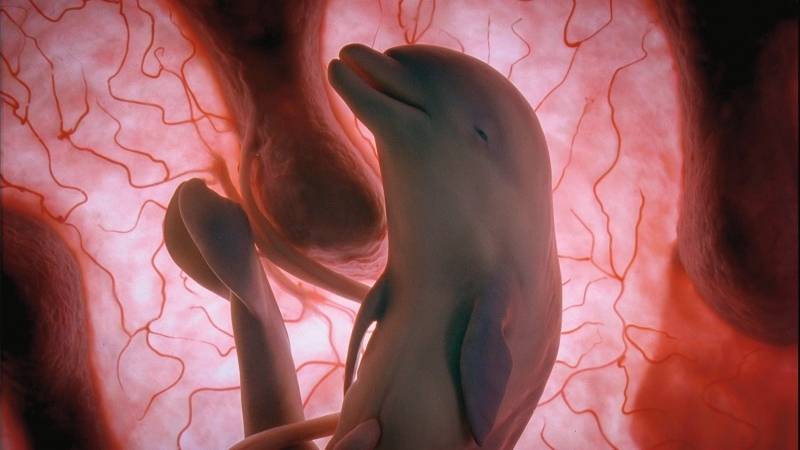 Like other dolphin species, they are equipped with audible sonar which is used for echolocating prey. 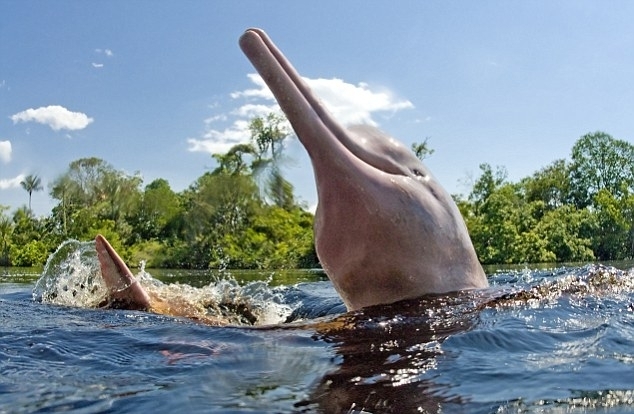 Amazon River Dolphins are found in South America from the Amazon River delta to the Andes Mountains. 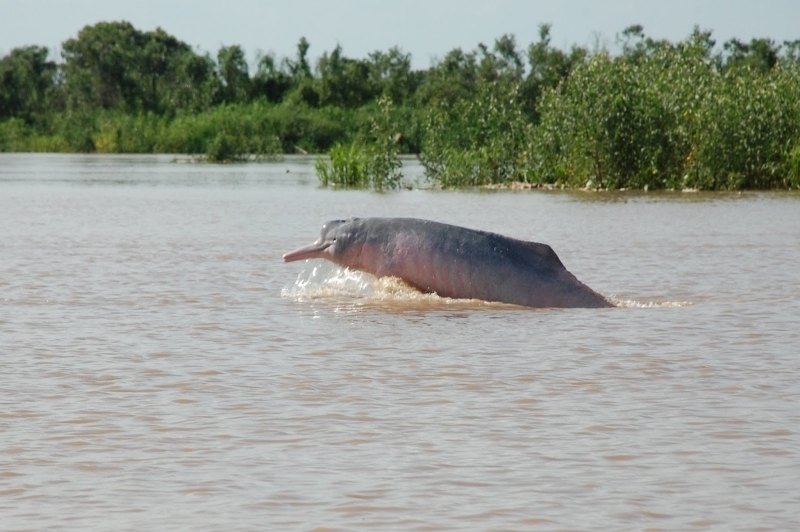 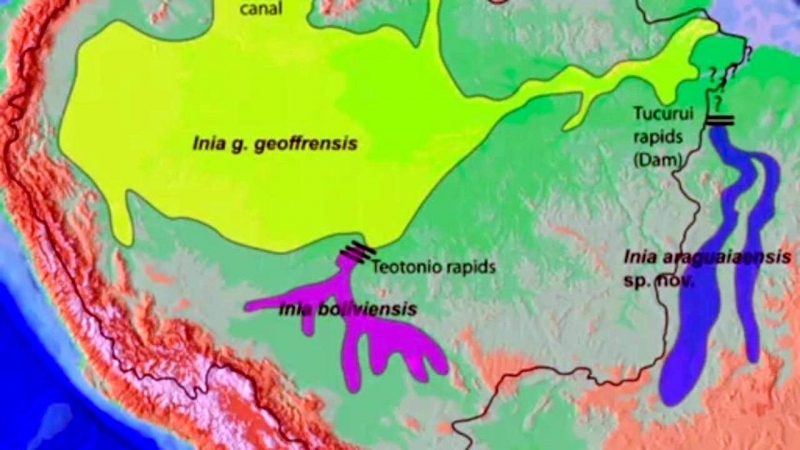 They can also be found in tributaries of the Amazon and in the Orinoco River and its tributaries in Venezuela. 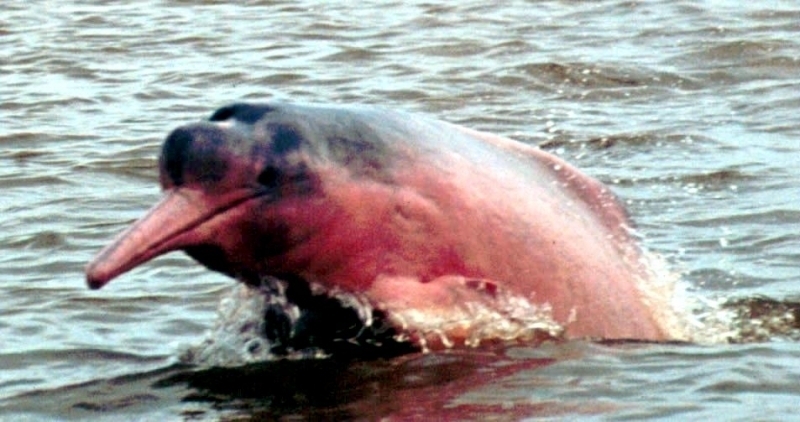 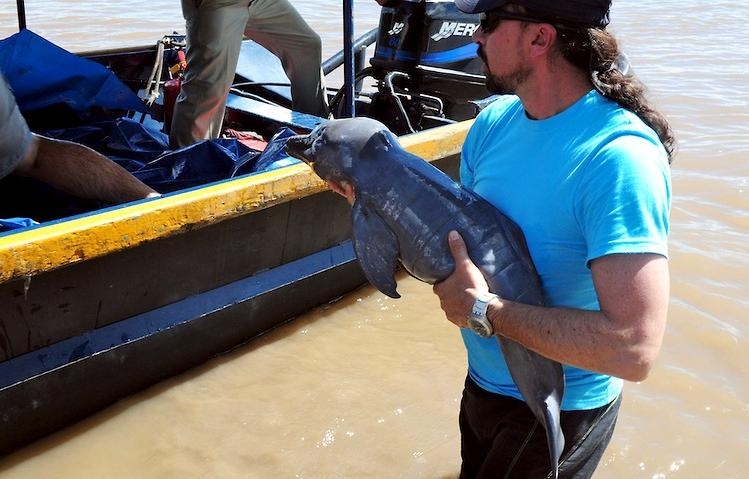 They also inhabit rivers in Columbia, Ecuador, northern Peru, Brazil and Bolivia. 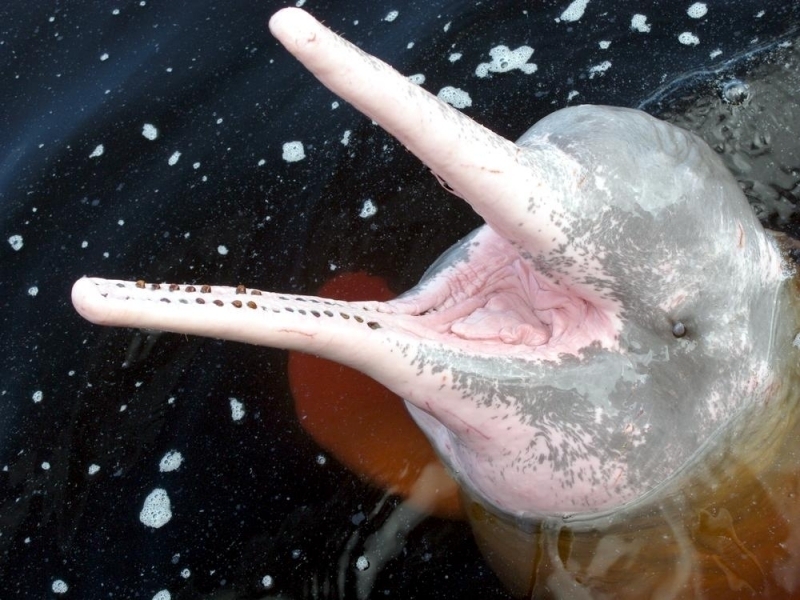 The species varies in physical characteristics by region causing some scientists to recommend reclassifying the species into subspecies.